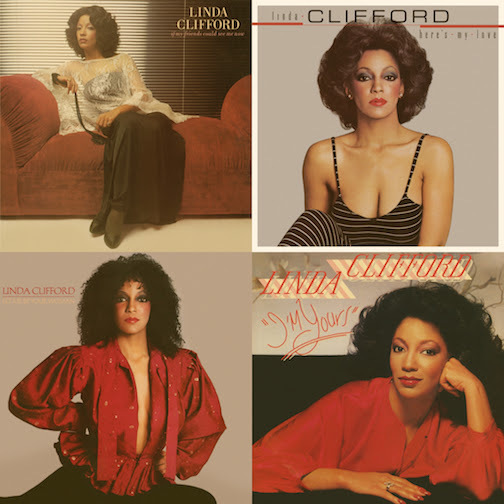 With the pantheon of disco recently being brightly relit by the Broadway treatment of Donna Summer’s life story, the time is ripe for a healthy redosing of the musical pearls of fellow vocal luminaries of the dance floor such as Linda Clifford. While the New York native built up her chops singing with a variety of show bands and cutting straight-ahead soul sides written and produced by the likes of Curtis Mayfield and Leroy Hutson, it was ultimately via DJ’s on the nightclub circuit that Clifford began to gain name recognition and establish a style that is sometimes imitated, but never quite duplicated. L.A.-based boutique label Blixa Sounds has studiously remastered and repackaged four of the nine albums Clifford recorded between 1977 and 1985, highlighting a remarkable span of material steeped in lush R&B, deep funk, and invigorating disco-R&B hybrids. The singer’s varied live performance experience over the decade prior to her breakthrough most certainly informed her strikingly confident tone in each framework, coming across equally as convincing on slow jams and mid-paced jollies as on the scorching hustlers. Among the 29 numbers (and 11 bonus mixes) contained on the reissues of If My Friends Could See Me Now, Let Me Be Your Woman, Here’s My Love, and I’m Yours, there’s seldom an unstimulating moment. The first three of the bunch were released during the prime of Mayfield’s Curtom label in association with then ever-bustling RSO Records, home to the massive Saturday Night Fever soundtrack. Clifford’s work notably stood out from the pack of unquestionably eclectic artists thanks to a no-holds-barred approach to both the funky R&B grooves and the straight-out disco floor fillers. On If My Friends Could See Me Now, Gil Askey’s driving production was unabashedly aimed at the clubs with no overt attempts to coral soul elements into the glitzy (yet instrumentally authentic) treatment of the title track, a number from the Neil Simon Broadway show, Sweet Charity. In fact, Clifford appeared as an uncredited dancer in the 1969 film adaptation; thus, her affinity for the rags-to-riches lyrics unwinds with a naturally soulful boldness resistant to showy antics. Contrastingly, there’s no questioning the gritty soul epicenter of “Runaway Love,” Clifford’s breakout top-five hit from the summer of 1978—also on If My Friends Could See Me Now. The seepingly punctuated horns, in-the-pocket drum groove, and sinewy guitar threshold is in immaculate sync with her take-no-prisoners dialogue and illustrious vocal sass. Meanwhile, the majestic unfolding of “Broadway Gypsy Lady” (a Mayfield composition slightly adapted from his 1963 hit with The Impressions, “Gypsy Woman”) brims with Spanish guitar amidst intriguing swirls of horns and strings which defy the parameters of any one genre. Clifford’s 1979 follow-up, Let Me Be Your Woman, found her with even more stride in her step, continuing to create impactful kinetic moments with Askey, as on the insinuating opener “Hold Me Close” and taking the real talk up a notch on the brightly groovin’ “Don’t Give It Up,” imbued with indelible refrains by The Jones Girls. Furthermore, the opus-like “One of Those Songs,” clocking in at 11 minutes and 43 seconds, entrances with rounds of modulations, more fine Jones Girls backings, and string flourishes invoking the chomping-at-the-bit essence of the conversational lyrics. Clifford carries out the affair with building fervor in complete tandem with the climactic flurry of horns and chugging rhythms. Certainly the most overlooked at the time of its release, Here’s My Love (also from 1979), maintained an underlying disco sensibility, but overall upped the sophistication level on the mellower grooves. Clifford radiated relatable resonance on the dreamy “I Just Wanna Wanna” (the set’s only U.S. single release), exhibiting a finespun grasp of subtlety and power atop the supple groove. This time around, the chief album producer was German Juergen Koppers, who also helmed tracks for Donna Summer and Pattie Brooks the same year. His adept handling of both the melodic and rhythmic components in the songs manifested particularly strongly on “I Just Wanna Wanna” and the top-down groovy “Never Gonna Stop,” lush in chordal atmosphere yet earthy in its sway. 1980’s I’m Yours was preceded by one of Clifford’s biggest crossover hits of the period, “Red Light.” Featured in that year’s blockbuster movie Fame, the catchy dance number didn’t have the same bite as many of her previous club romps, but it did showcase her ability to slip into a low-key mode suiting the characteristics of the song structure and its corresponding scene in the movie. Lamentably, the unraveling of RSO Records shortly thereafter resulted in minimal promotion of subsequent releases from I’m Yours. Although Capitol Records acquired the rights to the album and promptly signed Clifford, the missed opportunity of “Shoot Your Best Shot” was indeed a blow. As with the rest of the album (sans “Red Light”), Isaac Hayes handled production of “Best Shot,” and the end result was one of Clifford’s most dynamic disco numbers yet, with an injection of soul that put it a cut above the rest. Once again without going off the rails, she managed to make the number an incendiary call to the dance floor with her clear-cut delivery of the lyrics. Also convincing in assertiveness, “It Don’t Hurt No More” bristled with the victory of getting over a negligent lover, with each line fitting the thumping bass plucks and horn punctuations like a glove. Blixa Sounds’ reissue of these four impressive albums from the Clifford catalog is surely a noteworthy event. It’s the first time any of them have been issued singularly on CD in the U.S. (and, for three of them, worldwide). The bonus full-length disco mixes and radio edits of ten of the songs in total makes for a more complete listening experience than the original vinyl releases could provide at the time. Most importantly, though, there is now solid, in-print proof for a new generation of Clifford’s essential contributions to the world of disco at large. As an unaffected vocalist who never compromised her soulful side for commercial gain, she gave the gems within each album exciting distinction to both rev up the boogie and soothe the soul. Highly Recommended.